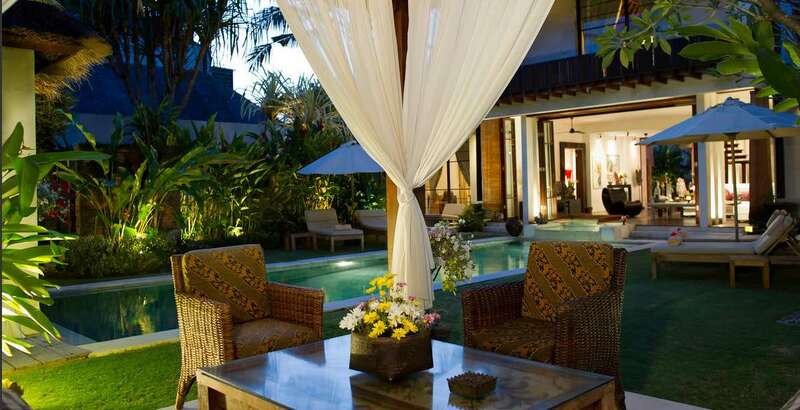 From $ 479AUD per night We have direct contracts with most villa owners. We don't add any booking fees. We are 100% transparent with no nasty surprises. 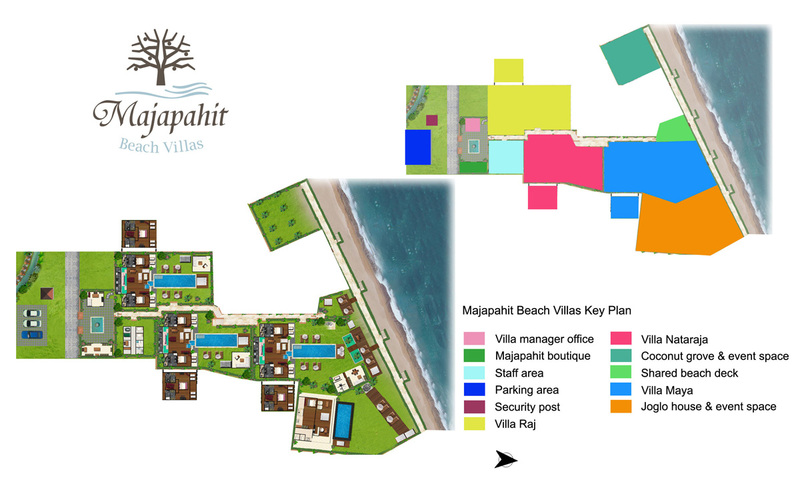 Luxury villa with beach front location - rent this now! 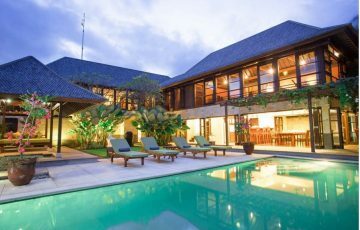 Villa Majapahit Nataraja is a 3 bedroom Sanur villa holiday rental surrounded by rice fields with and a beachfront setting the villa can be rented in conjunction with two more villas in the complex making it ideal for weddings and larger groups traveling together. 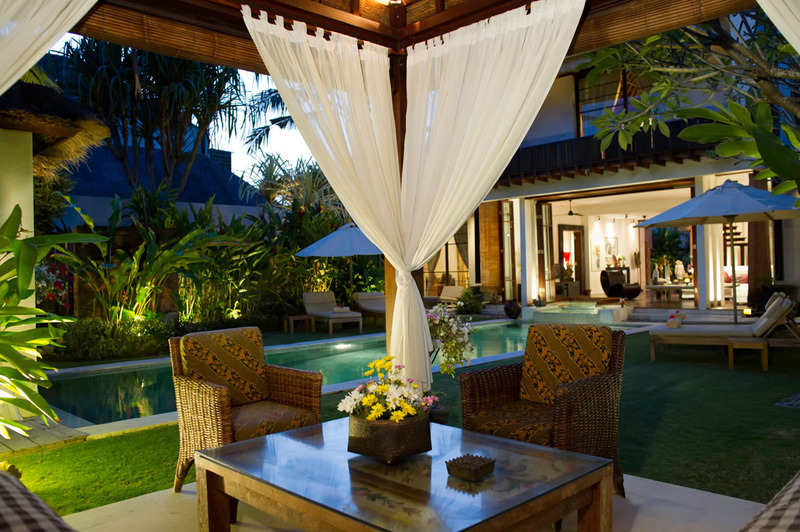 A stunning villa in one of the most peaceful settings you will find in Bali. 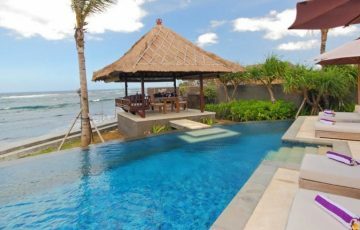 Pabean Beach is a peaceful and quiet beach where you may see the occasional surfer or local fisherman, making this the perfect holiday hideaway on Bali’s South East Coast. 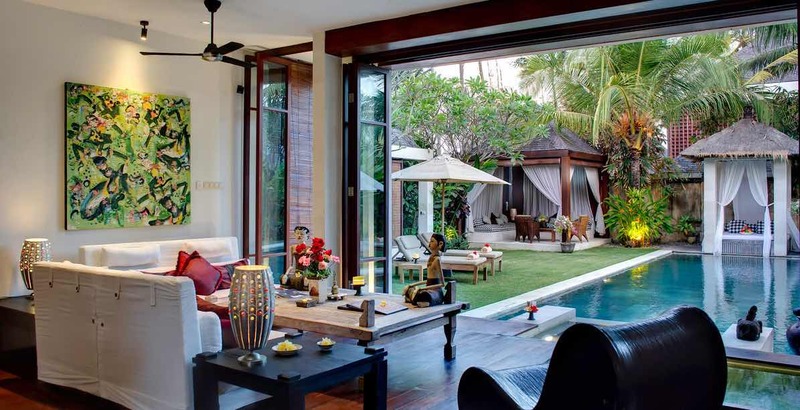 The garden is a tropical feast, flowering trees, plants, tropical palms encase the tall perimeter walls and the sparkling clear waters of the 12 meter pool with a shallower kids end. 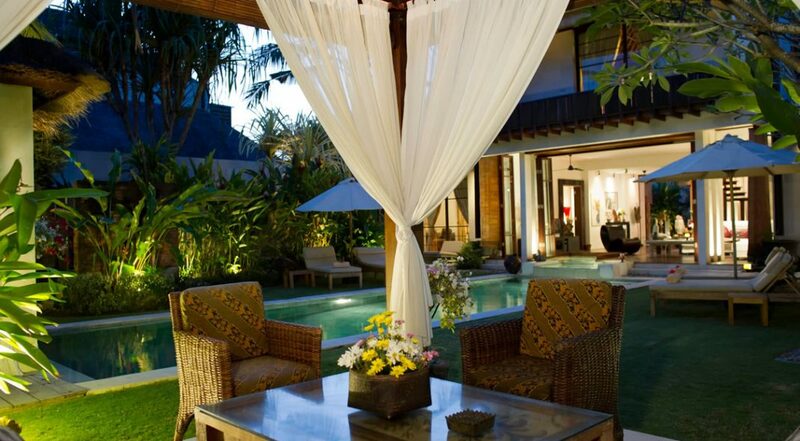 There are plenty of sunbeds and a relaxation bale to enjoy a pampering Balinese massage or maybe an afternoon siesta. 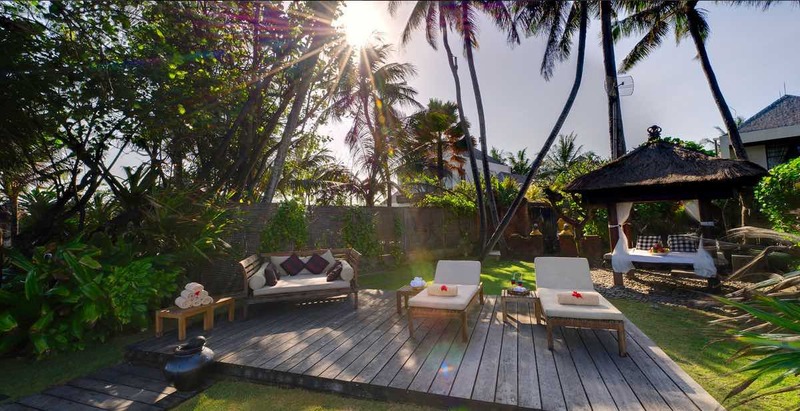 There is also a communal beachfront deck that can be shared by all villas in the complex with wonderful views to Mt. Agung. 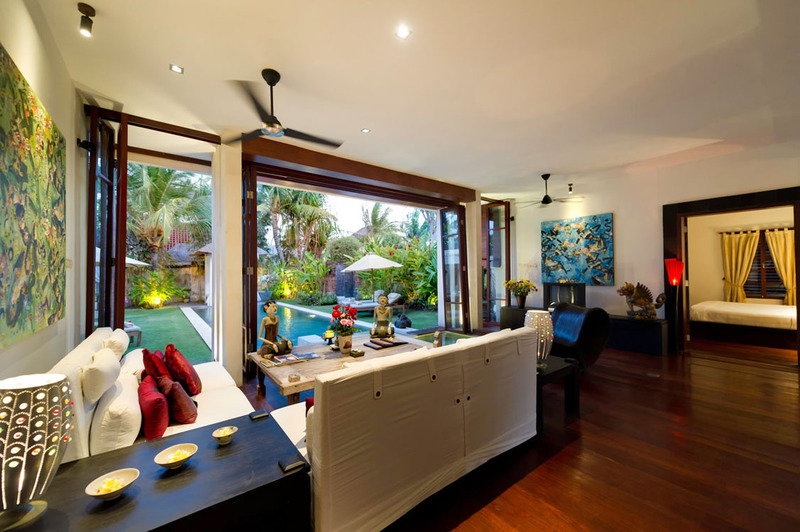 The living areas are filled with bright and modern pieces of art along with rustic and stylish furnishings including a solid timber dining table for 6 and a comfortable white sofa where you can all watch some TV together. 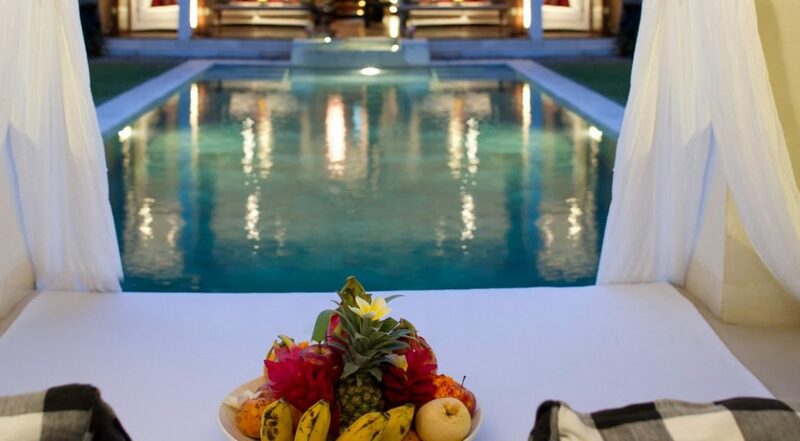 A night time dip with a cocktail in the Jacuzzi that extends into the living area, a great way to relax before retiring for the evening. 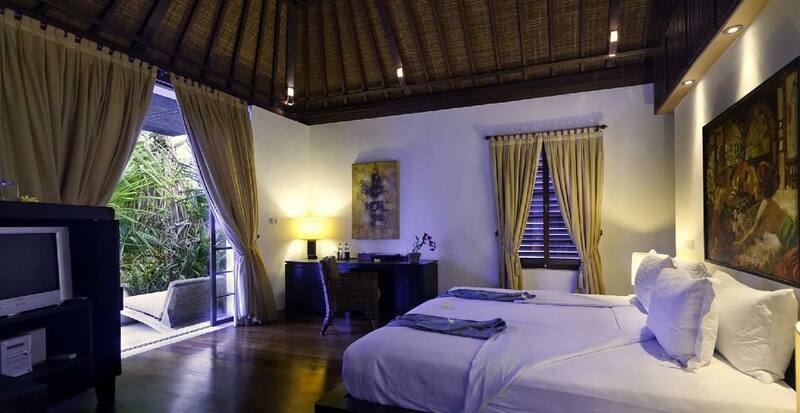 The master suite is located on the upper floor, a plush king size bed ensures restful sleeps, open the doors to your private balcony over looking the pool with a sneak peak of the ocean beyond. 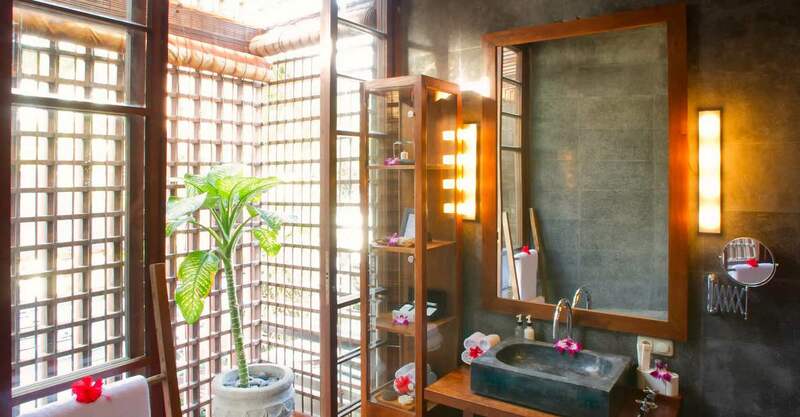 The two guest suites on the ground floor also feature premium king size beds with semi-open air tropical bathrooms, a rain shower and sunken tubs for complete rejuvenation. 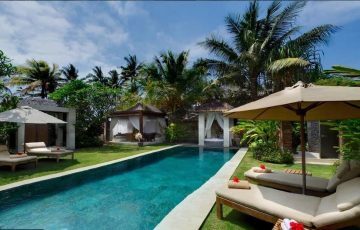 The complex is serviced by a team of professionally trained Balinese staff, offering warm and attentive care throughout your stay. 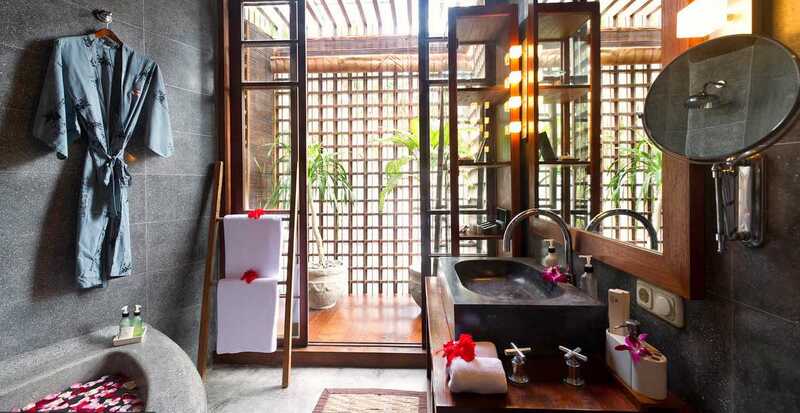 There are chauffeur driven cars, 24 hour concierge and dining services as well as fabulous spa services from massages to facials and pedicures. 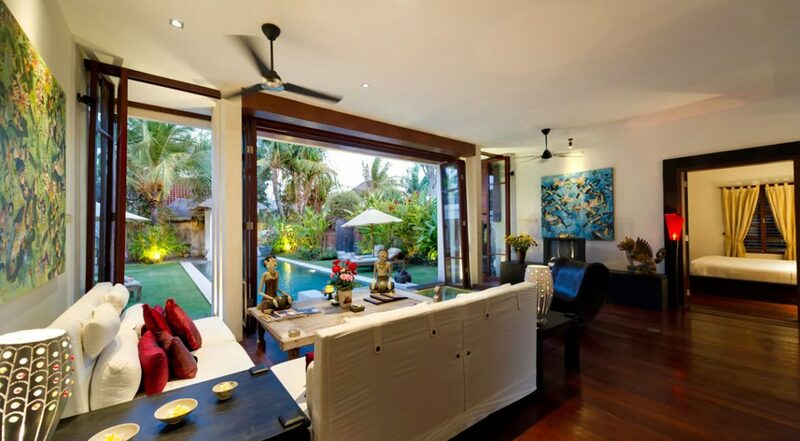 Located at Pabean Beach, the villa is situated around 10 km past the tranquil seaside tourist area of Sanur ( your villa driver can take you there), where you can do any shopping for groceries, walk along the beach front promenade and dine at the seafood restaurants, cafes and do some souvenir shopping at the same time. 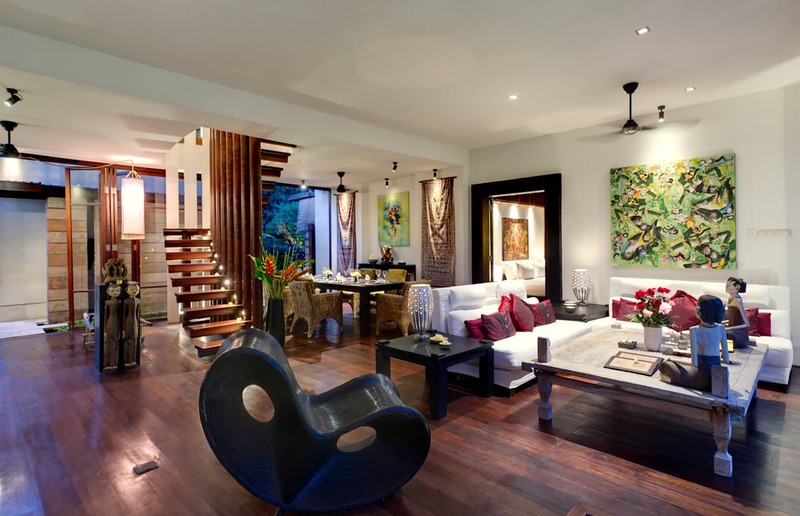 Ubud is also only a 30 min drive where you can visit art galleries and enjoy a slower pace of tourist enjoyments. 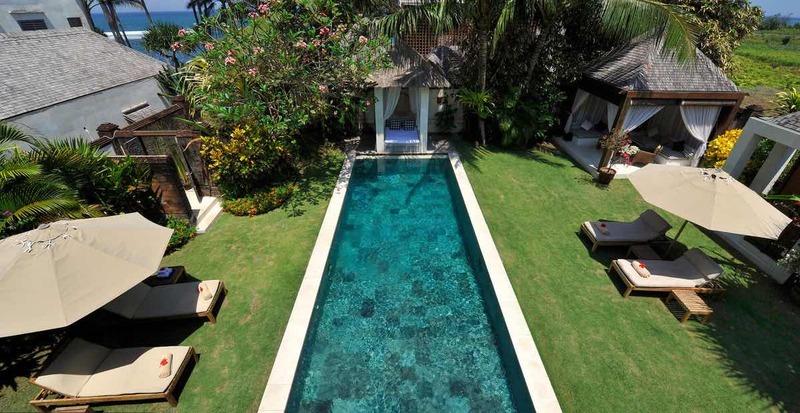 The Bali Safari & Marine Park is nearby for the kids along with the Bali Bird Park. 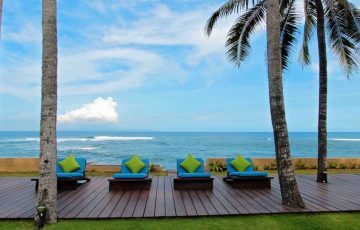 If you like surfing then the famous Keramas beach is also close by. 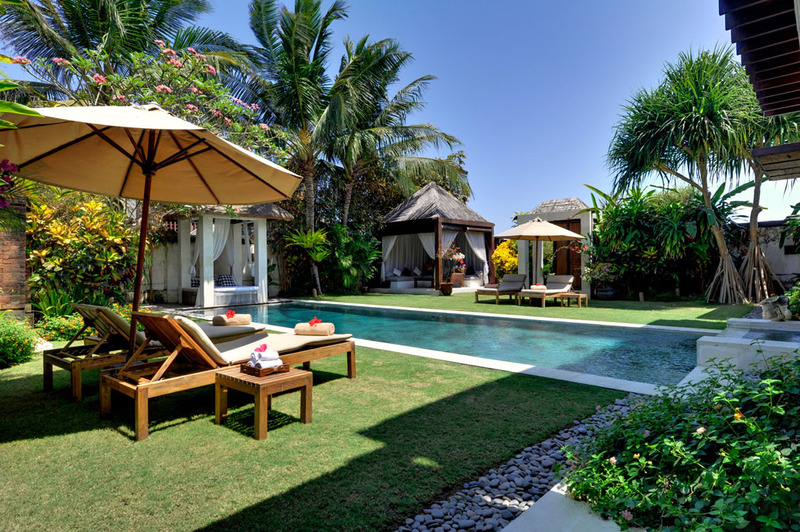 To view our full range of 3 bedroom Bali villas or other beach front Sanur villas please browse this website or contact our reservation team. 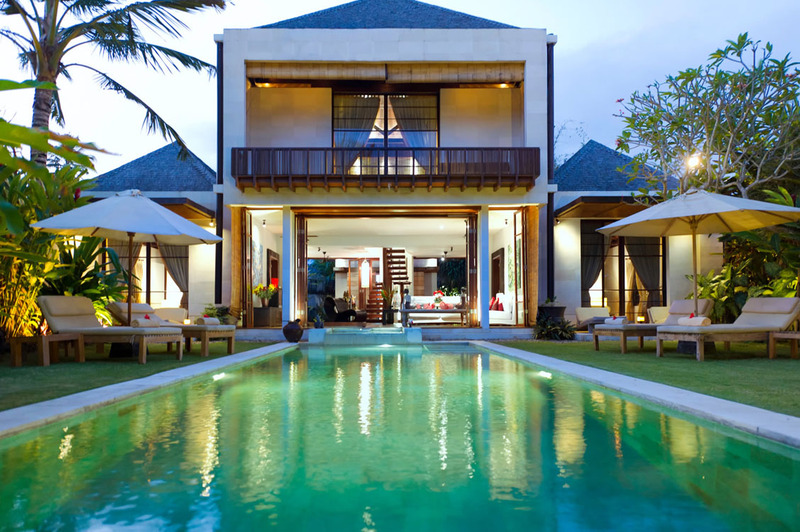 Villa rates are subject to 15.5% service charge, taxes, etc. Steven M - Clayfield Bris. 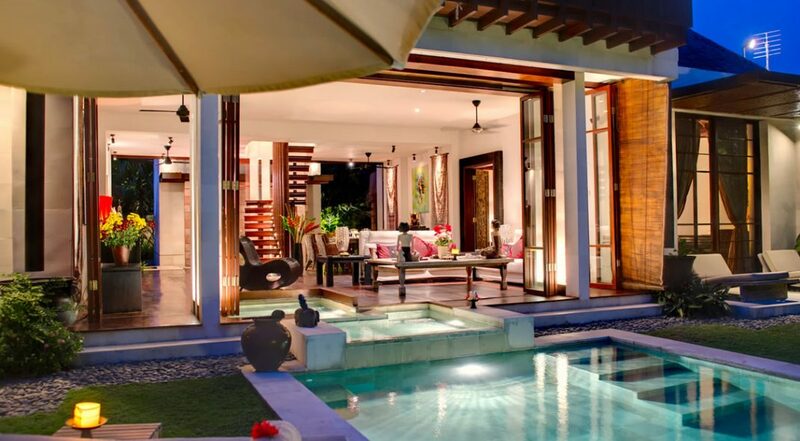 Sensational holiday villa in a really quiet area. 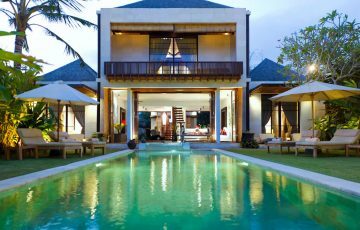 We were lucky enough to get this villa during the New Years period and were so happy to be away from the crowds and the noise. 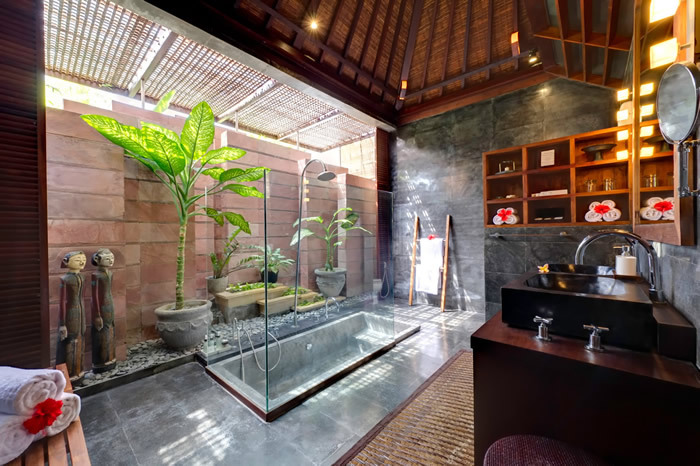 Perfect location and really good value considering the 5 star facilities and the unbelievably good level of customer service by the villa staff. 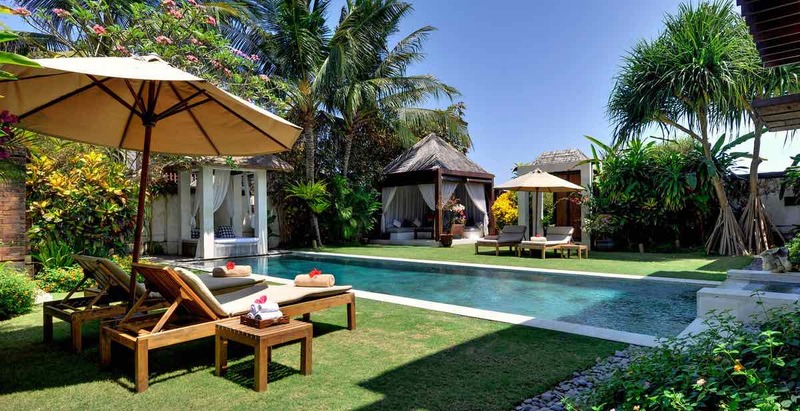 Just want to say thanks to Ina at Bali Villa Escapes for organising this tremendous holiday villa and for all her patience and fast response to our emails. 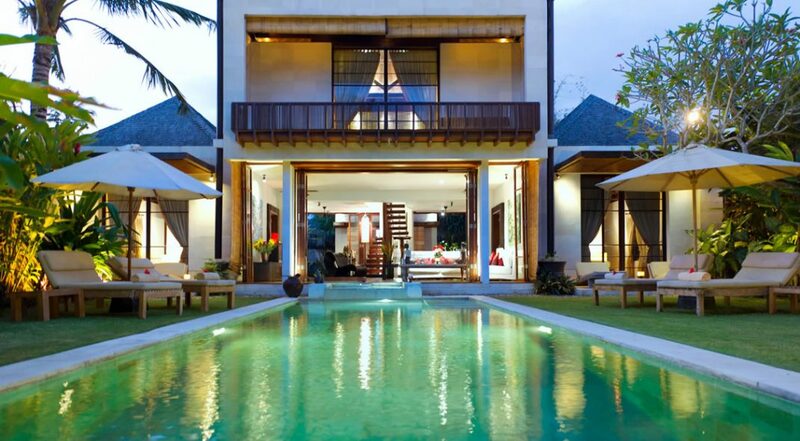 Definitely one of the better villas we have stayed in Bali. 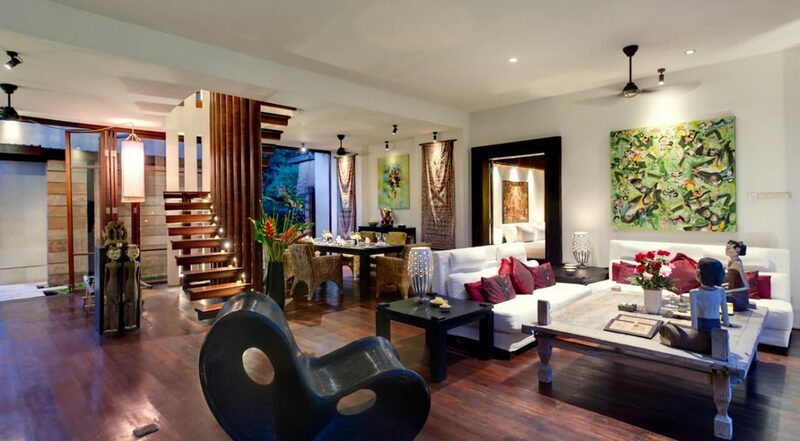 Modern, comfortable with lots of room. Location is also a real bonus being so close to the beach - this was sensational. Really quiet and chilled out. So much better staying here than other noisier areas. 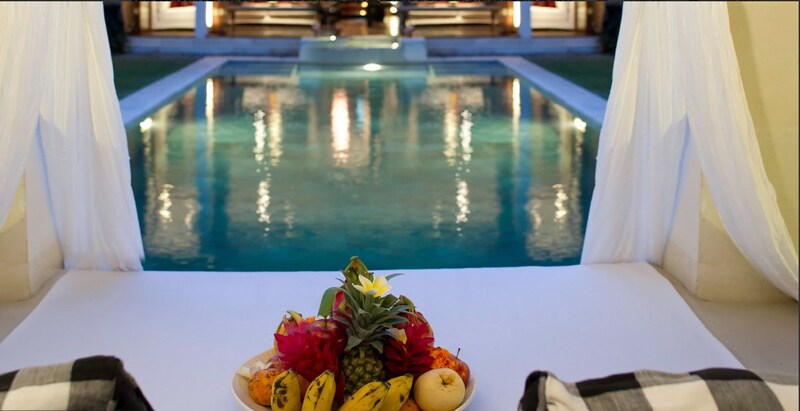 There was really no need to leave the villa as we have everything we could have possibly wanted. 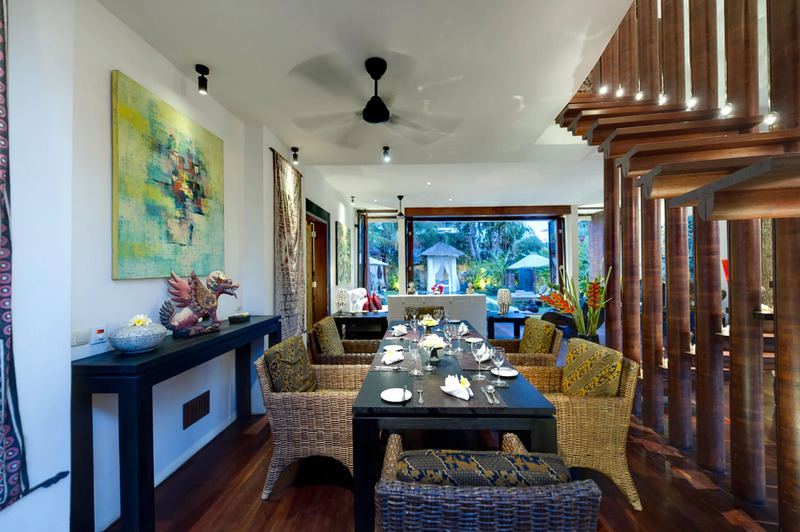 Enjoyed the fact that we had a chef who cooked sensational Balinese dishes for us and those breakfasts were a real treat. All in all I think this is really good value and happy to recommend it. 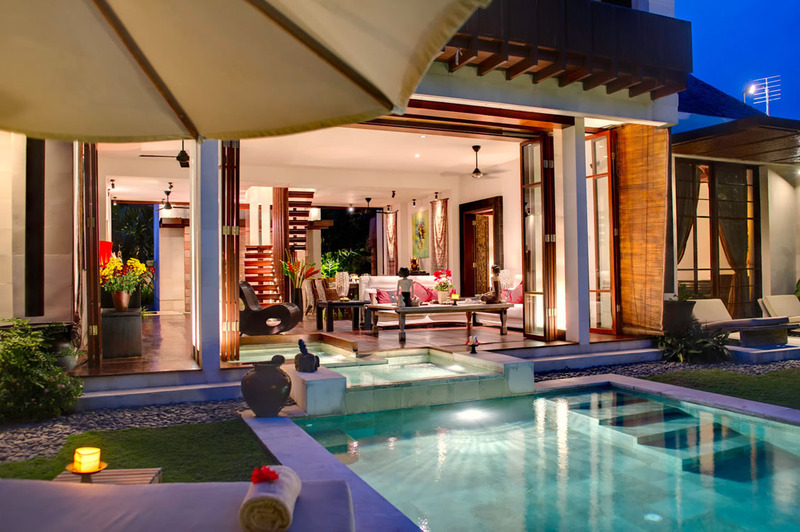 A lovely villa with some of the best staff I have ever met - loved the location and the whole ambiance - so relaxing and private. More than happy to recommend this wonderful place.